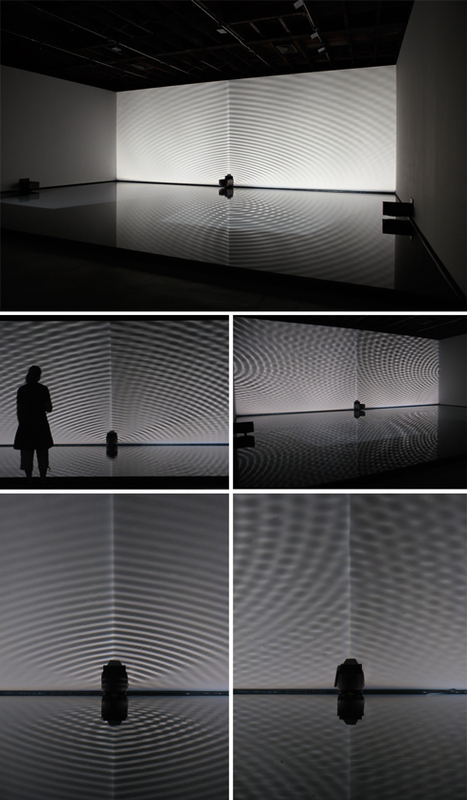 "In Reset 2011 I´m using tree sinus waves to create circular patterns on the surface of a large pool build in the gallery. 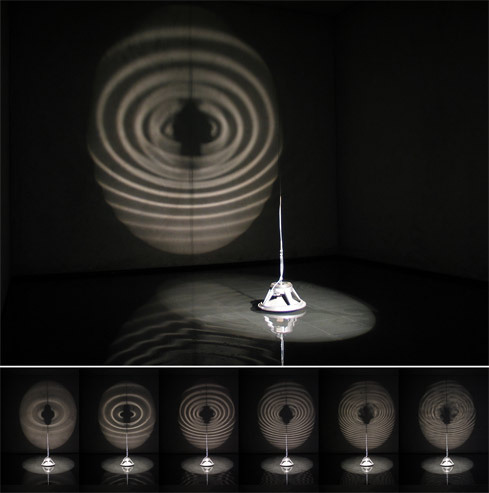 Spotlights shows the water reflection from different angle in one image on a opposite wall. The ripples travel across the water surface, they disappear for a short time when they reach a soft line in the middle of the piece , then appear bit later mixed with the ripples coming from the opposite direction. 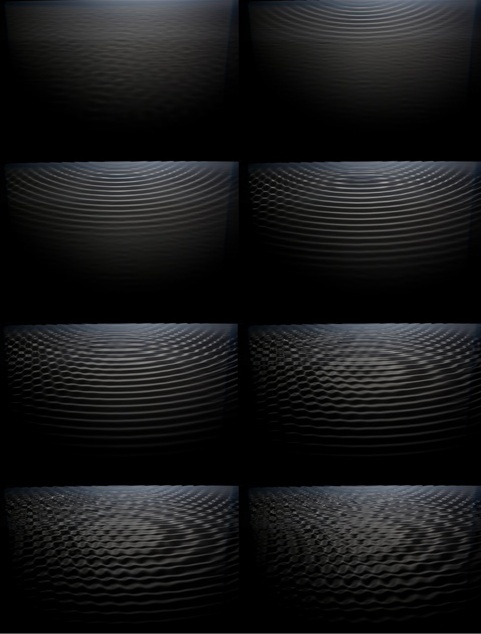 To gather they form a 3hz dreamless drawing. There are four categories of brainwaves, ranging from the most activity to the least activity. Delta brainwaves are the lowest brainwave frequency, they range from 1,5Hz - 4,0 Hz, but are the highest in amplitude. Delta waves are considered the Deepest possible level of mind / body relaxation and are commonly associated with the deepest sleep state and a state of unconscious awareness. 3hz lies just on the border between delta and theta waves, just after you stop dreaming." - Finnbogi Pétursson. "This phenomenon is one of the naturally occurring magnetic fields that have always surrounded us. It appears that the space between the earth’s surface and the ionosphere forms a gigantic resonant cavity with physical dimensions that give it a frequency somewhere between 7hz and 8hz, 7,83 to be exact. Producing sinus tones from 30hz - 42,8hz and run them parallel two and two. I create an interference wave of 7,8hz, known as the Schumann resonance." - Finnbogi Pétursson. 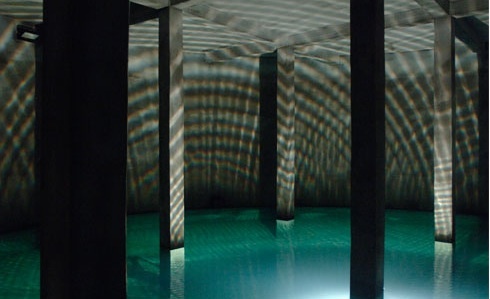 "In 1991 at the Living Art Museum, Pétursson installed a large loudspeaker suspended over a darkened pit filled with water. 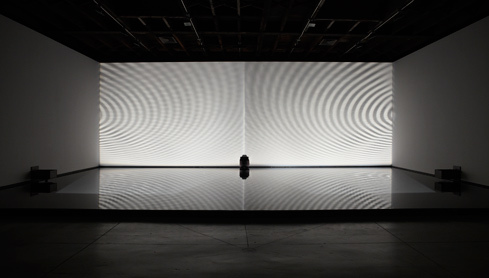 The work was titled Circle, since the loudspeaker formed a sound wave whose frequency was boosted to 0-200 khz and rippled the surface of the water so that the wave motion formed regular circles at certain moments of the process. As the pitch of the wave rose the pattern on the surface of the water changed, and was projected on to the wall. 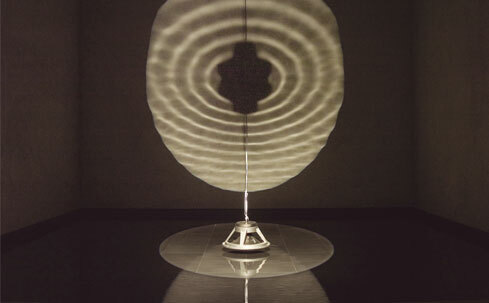 Aided by the water and the projector, the artist managed to make the amplification of sound visible. H.B.R. The loudspeaker forms a sound wave whose frequency is boosted to 0-40hz and ripple the surface of the water so that the wave motion forms regular circlesat certain moments of the process. 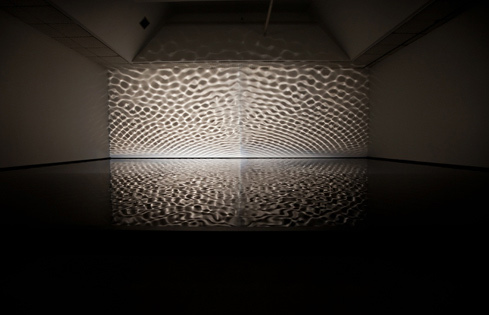 As the pitch of the wave rose the pattern on the surface of the water changed, and is projected on to the wall." - Finnbogi Pétursson.